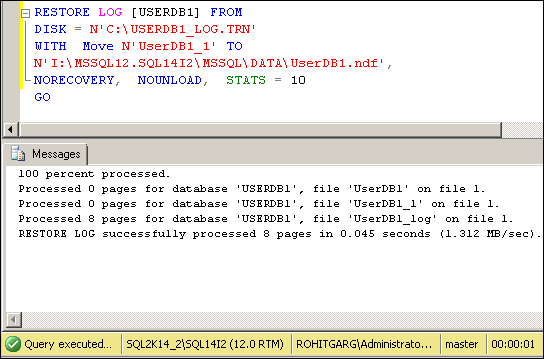 Add Database File on Database invloved in DB Mirroring. 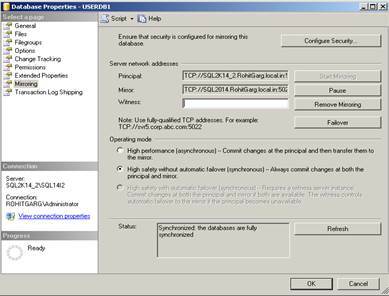 Cumulative Update – 4 for SQL Server 2014 RTM Is Now Available ! 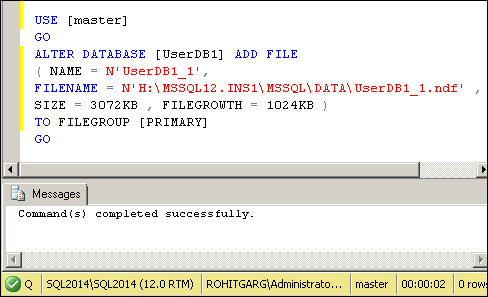 The 4thcumulative update release for SQL Server 2014 RTM is now available for download at the Microsoft Support site. Cumulative Update 4 contains all the hotfixes released since the initial release of SQL Server 2014 RTM. 1) After connecting to the principal server instance, Right-click the database & go to properties. Select Mirroring from left side option. 2) To remove the witness, delete its server network address from the Witness field. 3) Click Ok to confirm. You can also perform the same action by below T-SQL. Database Mirroring works on transaction logs. It applies transaction logs from Principle to Mirror. But Operation like addition of file is no log operation because of that file not be added to Mirror automatically. NOTE : In case your Database Mirroring has same file structure at both principal & mirror then no special steps needed. Once you add file at principal, file automatically added to mirror database. Above steps are valid only for different file structure at both principal & mirror. Thanks to my friend Sachin for pointing this to me.